Description: This course is for personnel involved in the operation and maintenance of ammonia refrigeration systems. 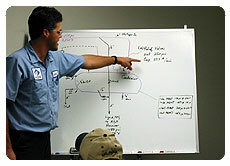 After completion of the course, you will have a better understanding of the workings of an ammonia refrigeration system including; single and two stage systems, fundamentals for both types, and proper pumpdown techniques. Additionally, you will understand how to read and understand P&ID’s, PFD’s electrical and assembly drawings. You will be awarded a certificate of completion after satisfactorily passing the examination given at the end of class. This course will also serve as a three-year refresher for Process Safety Management training. Prerequisite: Level I Ammonia Refrigeration, or other equivalent courses or training. Who should attend: Experienced refrigeration operators and technicians, refrigeration and maintenance managers and/or supervisors and maintenance personnel.